A balloon-assisted UAV (Unmanned Aerial Vehicle) named “Phoenix-S1,” developed by Kyushu University and Fukuoka University, Japan, has successfully brought back stratospheric aerosol samples from the altitude of 22 km and observed aerosol density at the altitude of 23 km in Antarctica on January 24, 2015. The observation was performed as one of the summer activities of the 56th Japanese Antarctic Research Expedition (JARE-56, the leader: Professor Yoshifumi Nogi, NIPR). Phoenix-S1, after launch from an observation site called “S17” on Antarctic continent ice sheet, climbed up being suspended under a rubber balloon while aerosol number density observation and sampling are performed. After the natural burst of the balloon at an altitude of 23 km, the UAV descended by a parachute, then started gliding back to the surface autonomously by separating the parachute and retrieved at S17 successfully. The maximum observation altitude this time is unprecedentedly high as the observation altitude using UAVs and even manned aircraft. This method is quite effective to retrieve observation apparatuses and aerosol samples from upper atmosphere easily at low cost. “Phoenix-S1” is a glider UAV (Unmanned Aerial Vehicle) for the observation of particle number concentration and sample return of aerosols in the upper atmosphere. The UAV is released from the ground being suspended by a rubber balloon as shown in Fig.1. It climbs up until the balloon bursts naturally while observing particle number concentration and sampling of aerosols. After the burst of the balloon, the UAV glides back to the launch point autonomously with the expensive observation apparatuses and precious aerosol samples. 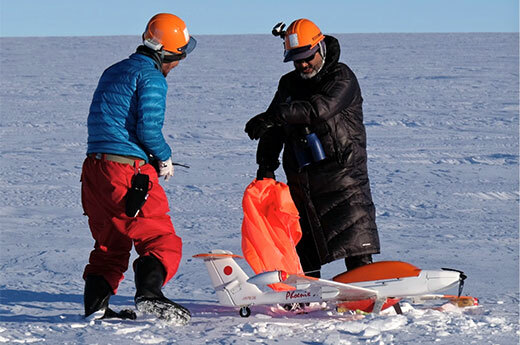 This observation method combining a free balloon and an autonomously gliding UAV was firstly introduced in the summer activity of the 54th Japanese Antarctic Research Expedition (JARE-54), and successfully performed the observation and the sample return up to 10km in altitude (cooperative press release of NIPR, Fukuoka University and Kyushu University, 17th February 2013, in Japanese). Phoenix-S1 has been developed improving the UAV used in the JARE-54 so that it can cope with the severer environmental conditions at higher altitude. The UAV was launched from the observation site called “S17” on Antarctic continent ice floor near the Japanese Syowa Station at 6:05 pm (local time) on 24th January 2015. It reached the altitude of 23km at 7km west of S17 approximately one hour after the launch, then the balloon burst naturally. Phoenix-S1 descended down to 12km in altitude by a parachute, ,and glided back to S17 autonomously after separating the parachute and retrieved at 8:10 pm (local time) successfully. The collected samples are carried back to Japan for electronic microscopic analyses to observe number concentration and distribution of aerosols. This is to clarify the process of materials circulation which has close relationship with the several current climatic issues such as global warming and an ozone hole. We can understand how the earth’s atmosphere circulates and which materials move and react each other by surveying the number concentration distribution and composing materials of aerosols at various location and altitude on the Earth. The results become very important clues not only to clarify the mechanism of the current climatic issues such as global warming and an ozone hole, but also to predict the future trend of the issues. For this reason, various institutes in the world including Fukuoka University and the National Institute of Polar Research, Japan, have been observing aerosols continuously as a global scale. The observation method using a free balloon is virtually the only way to perform at reasonable cost for the observation of aerosols of upper atmosphere higher than the altitude reachable by manned aircraft. However, the method using a free balloon has major two drawbacks; 1) difficulty in retrieving precious collected samples and 2) high cost of the observation apparatuses. In order to solve the problems, the balloon-assisted gliding UAV has been developed combining the climbing capability of a free balloon and the autonomous returning capability of an UAV through the collaboration of Kyushu University (development and operation of the UAV) and Fukuoka University (development of observation apparatuses and observation). Fig.2 Phoenix-S1 returned to S17 from the altitude of 23km. The Phoenix-S1 UAV has been newly developed improving the prototype UAV used in the JARE-54 so that it has more payload space and bears up severe environment such as low temperature down to -80 degrees C and lower air density at 30km in altitude. Fig.2 shows the Phoenix-S1 just after the retrieval at S17, and Table 1 describes the specifications of the UAV. Because it was predicted that the flying speed of Phoenix-S1 at 30km in altitude becomes close to the sonic speed if it flies under the same condition close to the ground, the structural strength and the flight control performance will go beyond the limit of the design at such a high altitude. For these reasons, Phoenix-S1 is equipped with a device called “flaps” in order to reduce its flying speed while avoiding stall, and adopted the descending method named “two-stage separation method”. 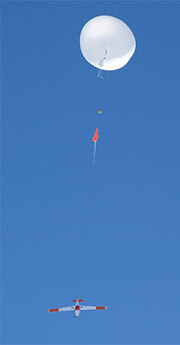 In this method, the UAV firstly descends down with a parachute after the burst of the balloon to an altitude at which the behavior of the UAV is predictable, then it starts gliding after separating the parachute. Step by step trials involving the modification of a simulation model from the flight data, the prediction of the behavior of the UAV at higher altitudes, and the redesign of the flight control parameters have been performed repeatedly in this order by changing the separation altitude, and they finally achieved UAV flights safe and success..
An optical particle counter and a particle sampler were installed in Phoenix-S1 for the measurement of particle number concentration and for aerosol sampling, respectively. Fig. 3 shows the vertical profiles of number concentration of aerosols with diameter of 0.3 to 0.66 micrometer. It is obvious that stratospheric aerosol is composed of three layers, i.e., at 9 to 11 km, 11 to 13 km and 13 to 23 km in altitude. Each layer may have different histories reflecting stratospheric-tropospheric exchange, extremely low temperature during Antarctic winter and so on. Aerosol composition will be clarified by the analyses of the aerosol samples using an electron microscope and an X-ray analyzer in Japan. 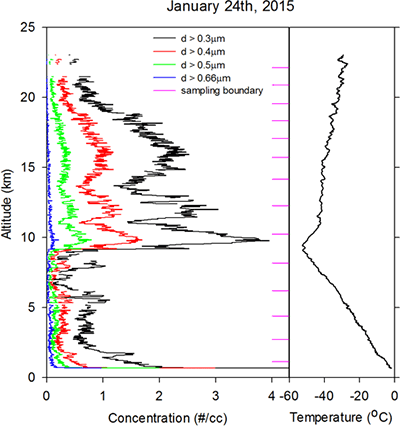 Thirteen sets of aerosol samples were obtained from 1.1 to 22km with average vertical resolution of 1.7km, whose boundary altitudes are shown by the violet horizontal ticks in Fig. 3. This flight marked the highest observation altitude record, not only by an UAV but also by manned aircraft. We will obtain further understanding on an ozone hole, if we can observe stratospheric aerosols during winter in Antarctica using this method. It is also expected to apply this novel method to other scientific field. 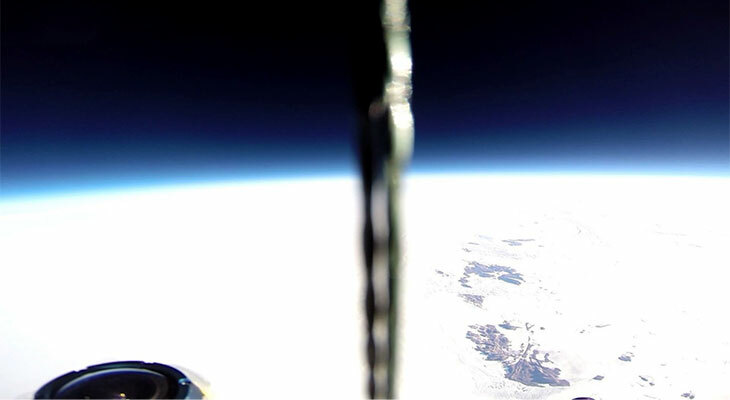 Fig.4 demonstrates the picture taken from Phoenix-S1 at 23km in altitude. The contrast of the darkness of the sky and the whiteness of the Antarctic continent is quite impressive. Fig.4 A picture taken from Phoenix-S1 at 23km in altitude. Bare rock area of Soya coast is seen at the right.